Note: You can find how BooksList.xml is created from the article How to use XMLTextWriter to create an XML document in C#. A typical application might read data from an XML file and place it directly into the corresponding objects. 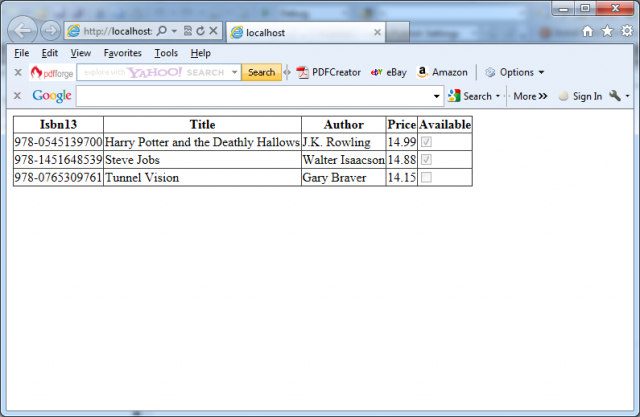 The next example shows how you can easily create a group of Book objects based on the BookstList.xml file. This example uses the generic List collection, so you should import the System.Collections.Generic namespace. – This code uses a nested looping structure. The outside loop iterates over all the books, and the inner loop searches through all the child elements of <Book>. – The EndElement node alerts you when a node is complete and the loop can end. Once all the information is read for a product, the corresponding object is added into the collection. – All the information is retrieved from the XML file as a string. Thus, you need to use methods like Decimal.Parse or Boolean.Parse to convert it to the right data type. – Data binding is used to display the contents of the collection. A GridView set to generate columns automatically creates the table shown in the next picture.